Not long after the 1979 election, Home Secretary William Whitelaw had announced he was going full steam ahead on a key manifesto promise – the Short Sharp Shock. To a euphoric Tory party conference in October 1979, the urbane and aristocratic Whitelaw told delighted delegates that detention centres for teen lawbreakers would no longer be ‘holiday camps’. This played on widely believed, media stories of young hooligans leading cosseted lives behind bars. “Life will be conducted at a swift tempo,” he assured the party. The belief was that a regime of early wake up calls, military drill and manual labour over a three month period would shock young offenders out of a life of crime. To break even the most determined spirit, periods of recreation could be denied, silence was the general rule with only 30 minutes of chat between prisoners permitted each day. The Short Sharp Shock regime kind of resembled the opening half of the movie Full Metal Jacket – a mindless ultra-disciplinarian series of routines that aimed to bury liberal attitudes to offender rehabilitation once and for forever. This was going to be punishment pure and simple and the duly traumatised young criminals would keep their noses clean from then on. Curiously, prisoners at one of the four Short Sharp Shock centres, Glenochil in Scotland, were referred to as ‘trainees’. They were assessed in the mundane tasks they were ordered to perform, like cleaning the floors, and given colour coded tokens to mark out levels of achievement. Under the terms of Whitelaw’s 1980 Criminal Justice (Scotland) Act, any young offender banged up for less than four months at Glenochil could expect a regimented hell. Dormitories spotless by 6.45am while prison officers with peaked caps and pulled down shirtsleeves tipped over their bed mattress for any minor infraction and ordered it remade. Marching was seen to be the idea therapy for these youngsters. Marched to breakfast, marched to their cells, marched to the work areas and then marched to their tea break. They were even forced to jog on the spot until told to stop. Some of this simply echoed the kind of regimes that already existed in borstals but with greater intensity and over a shorter time period. But it also signaled a view in government circles that a crackdown was needed on Britain’s wayward youth, a reversal of the permissive society kicked off in the 1960s and perceived to have set in train some kind of moral decline. But it wasn’t morals that these young primarily lacked. It was jobs in the real world. Most of those sent to the designated Short Sharp Shock centres had committed acts of theft or stolen vehicles and something like 90%, according to the Sunday Times, had no work at the time of offending. In an unfortunate twist for the government, these kids with little by way of a future often found the regime a relief from the drudgery outside. Effectively, it took their minds off how dreadful things had become in their shattered communities. In my view, only one riot in 1981 could be described as a white v black confrontation and that was Southall where National Front supporters and predominantly Asian youth clashed. But as for Toxteth, Moss Side and Brixton – the frustration of black youth was allied to a furious despair among unemployed whites and their target was mainly the police. However, the veteran prophet of doom Enoch Powell wasn’t going to let the riots pass without fulminating in parliament that a race war was round the corner. He banged on that none of this would have happened if the “New Commonwealth” population hadn’t been allowed to grow. Powell then turned to some familiar fear mongering stating that immigrant areas were forever expanding and the “indigenous population” must “retreat house by house at the same rate”. This didn’t impress Home Secretary Willie Whitelaw. An old aristocratic Tory, he slapped Powell and the others down pointing out that the black community living in Toxteth, Liverpool had been there for 150 years. They weren’t newcomers. More interestingly, Whitelaw said the racial composition of the rioters in Toxteth had changed night after night – becoming noticeably whiter! These are his exact words to parliament on the 16th July, 1981. “The first night consisted largely of black youths, children of many generations of Liverpool people, erupting against the police. The second saw a concerted attack on the police by white and black youngsters. The third witnessed a predominantly white crowd of looters exploiting the earlier disturbances, while local black leaders played a major part in keeping their young people off the streets”. Whitelaw admitted young people in Britain were experiencing deep frustration. He added that violence had already been seen breaking out at football matches and had now burst forth on to the streets. “The problems of urban decay and deprivation are intractable and deep-seated, particularly in Merseyside, despite decades of efforts to remedy them and the expenditure of very considerable sums of public money”. 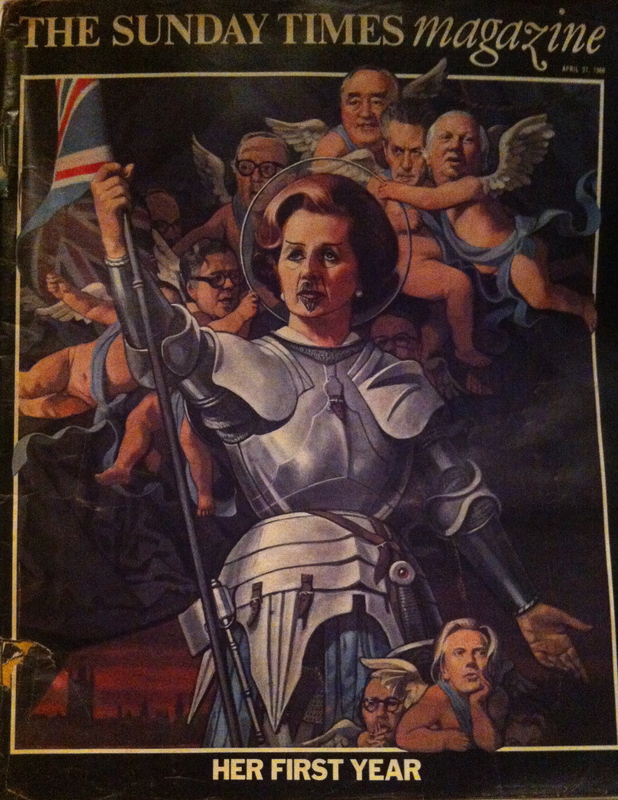 Here’s an interesting front cover from a Sunday Times colour supplement in 1980 “celebrating” the first year of Thatcher in power. Me or my sister defaced Maggie’s face with a beard and moustache at the time! Around her head – framed like Joan of Arc – are winged angels representing (from left to right) Geoffrey Howe, Lord Carrington, Willie Whitelaw, Keith Joseph and Jim Prior. Down below is Michael Heseltine looking a little wistful. At that stage, Thatcher was embattled and rumours were flying that Heseltine had his eye on Number 10.